Tightrope Books, Inc., 9781926639826, 150pp. After a Christmas Eve shooting that devastated author Emily Pohl-Weary’s family, she began to hunt through the sorrow and trauma for a sense of hopefulness. 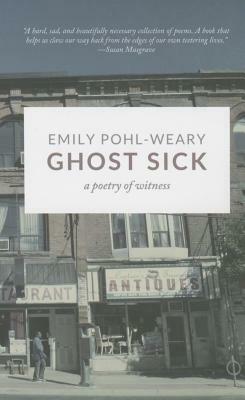 In the tradition of Carolyn Forché, Ernesto Cardenal, and Shu Ting, Ghost Sickness is a poetry of witness. It chronicles the impact of violence and poverty on an inner-city Toronto neighborhood, the power of empathy, and the resilience of the human spirit.